The jewish Torah was first written down 500 BC without vowels, and it was in possession of the priests and of a small social-layer that could read and write at all. Most of the texts of the Old Testament are secret writings with allegories and with a kabbalistic background, and therefore they contain veiled descriptions of the path. According to the Kabbalah, the Bible can be interpreted on up to 72 levels. I just want to touch here a few examples: Exodus, Noah, Jonas, Genesis, Solomon, Abraham. The EXODUS of the Israelites ('triumph with God ') from egyt and the 40-year hike to the promised land is nowadays a scientifically controversial transmission, as a rider could cross the desert of Sinai with a fast camel within one day. Also the date of the destruction of Jericho is not archaeologically traceable. The inner path of the 22 steps begins in Exodus with the first experience of the "I AM THE I AM" (the higher Ego, U.Path step 2.2 : fire-cycle) of Moses ('' מֹשֶׁה '' '-' Mošeh ''), the higher self. The resistance of the Pharaoh und the 10 plagues describe the steps 3-12 of the Universal Doctrine. The ninth plague with the three-day darkness symbolizes the dark 'Saturn - phase' of step 11 (beginning of the sixth cycle in the Opus Magnum). At step 12, the firstborn of the Israelites survived only because they had "smeared their doorposts with Lamb-blood" (columns similar to the columns Jachim and Boaz of the Hiram : 1 Kings 7:46). The tarotcard 12 shows the two 'posts' of this door. After passing through the Red Sea and the death of the Egyptians, the lower human self (13.3 water : ie, the body- near forces; U.Path step 13 - the Tarotcard 13 shows death) the path leads to Mount Sinai (U.Path step 14.2). A mountain stands symbolic for the emerging into the divine. Here, a first culmination of the development is reached, the first big initiation and spiritual developement to the height of a cherub, the true rebith from 'water and spirit'. Moses receives the tablet with the 10 commandments on the top of the mountain. Similar tables can also be found in Egyptian drawings. They contain not just some fundamental moral rules but symbolize a certain amount of spiritual development which is connected with these rules. 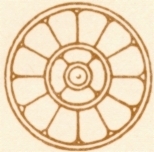 The "manna" also has a different meaning, which in the final enlightenment of step 19 becomes a permanent "nectar" (or Soma). After the return from Mount Sinai, Moses destroyed the Golden Calf, around which the Israelis danced. Moses and Aron lead the Israelites. The name of Aaron, who later survives Moses and then leads the Israelites to Canaan, also means "the enlightened." The fall of the city of Jericho (a city is usually the symbol of a chakra) under trumpet sounds (the 'Schem', logo or Shabda), which also indicates the stae of development. A similar city Babylon falls (for the Svadisthana -Chakra) also in the 22-stage Apocalypse of John in chapter 18. Sri Aurobindo also said that the enlightened have a constant sweet taste in the mouth. In the Song of Solomon 4.11 is similar to read: 'Milk and honey are under your tongue'. Thus the first part of the resume of Moses, up to its walk into the desert, can be explained as a symbolic description of the three involutionary human pre-steps. Emanuel Swedenborg, too, had written about the deeper meaning of the first and second books of Moses (Exodus) and the loss of the correspondence science in the churches. The story of NOAH (Noach) in the Genesis has similarities with the epic of Gilgamesh, who also builds an ark, with Ziusudra ('Life of long days') as well as with the myth of the greek Deucalionic Flood, the flood of the Matsya - Purana and the Atraḫasis Epic. The following journey of Noah with the ark after the built of the arc and the rain (of step 7) corresponds here to the step 8 (Pranayama : purification of the Prana) . Noah is allowed to take only one specimen of each species, ie. he must abandon his animal impulses to the archetype. Noah and his sons are finally blessed by God. The appearance of the rainbow indicates the successful construction of the rainbow bridge (Anthakarana), ie. the Venus-phase of step 8.2, which in a different context is also known as a peacock tail or peacock tail. In the first Petrine letter, the christian initiate Peter therefore compares the salvation of Noah across the water with baptism (John) 'Which sometime were disobedient, when once the longsuffering of God waited in the days of Noah, while the ark was a preparing, wherein few, that is, eight souls were saved by water." A well-known story is also the story of king Solomons master-builder Hiram (Hebrew Hiram or Hirom, 1 Kings 5: 15-32, Greek H(e)iram or Churam), who built the solomonic Temple with the columns Jachim and Boaz (see Tarotcard 12), into which the Divine (Jehovah) later moves. The slightly different version of the freemasons refers however to Hiram Abif. Salomon (Hebrew: שְׁלֹמֹה) was the second son of his deceased father King David. 3Solomon showed his love for the Lord by walking according to the instructions given him by his father David, except that he offered sacrifices and burned incense on the high places. 4The king went to Gibeon to offer sacrifices, for that was the most important high place, and Solomon offered a thousand burnt offerings on that altar. Gibeon was a mighty city and a later priestl-city and the most important hill. The later fire sacrifice altar was also in front of the temple. 1 Könige 5 : 9And God gave Solomon wisdom and understanding exceeding much, and largeness of heart, even as the sand that is on the sea-shore. 10 And Solomon's wisdom excelled the wisdom of all the children of the east, and all the wisdom of Egypt. 11 For he was wiser than all men: than Ethan the Ezrahite, and Heman, and Calcol, and Darda, the sons of Mahol; and his fame was in all the nations round about. 12 And he spoke three thousand proverbs; and his songs were a thousand and five. 13 And he spoke of trees, from the cedar that is in Lebanon even unto the hyssop that springeth out of the wall; he spoke also of beasts, and of fowl, and of creeping things, and of fishes. 14 And there came of all peoples to hear the wisdom of Solomon, from all kings of the earth, who had heard of his wisdom. 1 Kings 5.1 1 And Hiram king of Tyre sent his servants unto Solomon; for he had heard that they had anointed him king in the room of his father. For Hiram was ever a lover of David. 2 And Solomon sent to Hiram, saying, 3 Thou knowest how that David my father could not build an house unto the name of the Lord his God for the wars which were about him on every side, until the Lord put them under the soles of his feet. 1 Könige 7:13... 13 King Solomon had Hiram(Hebräisch Hiram bzw. Hirom, griechisch H(e)iram oder Churam) brought from Tyre. 14 He was a widow’s son from the tribe of Naphtali, and his father was a man of Tyre, a bronze craftsman. Hiram had great skill, understanding, and knowledge to do every kind of bronze work. So he came to King Solomon and carried out all his work. 15 He cast two bronze pillars, each 27 feet high and 18 feet in circumference. 16 He also made two capitals of cast bronze to set on top of the pillars; 7½ feet was the height of the first capital, and 7½ feet was also the height of the second capital. 17 The capitals on top of the pillars had gratings of latticework, wreaths made of chainwork—seven for the first capital and seven for the second. 'He made the pillars with two encircling rows of pomegranates on the one grating to cover the capital on top; he did the same for the second capital. 19 And the capitals on top of the pillars in the portico were shaped like lilies, six feet high. 20 The capitals on the two pillars were also immediately above the rounded surface next to the grating, and two hundred pomegranates were in rows encircling each capital. 21 He set up the pillars at the portico of the sanctuary: he set up the right pillar and named it Jachin; then he set up the left pillar and named it Boaz. 22 The tops of the pillars were shaped like lilies. Then the work of the pillars was completed. 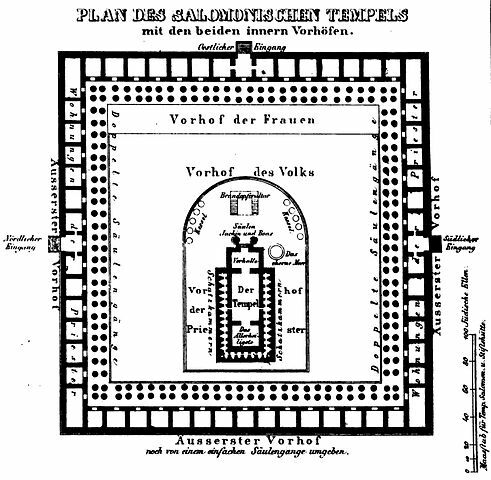 The entrance of the Solomonian temple was preceded by a fifteen-meter-deep entrance hall with two bronze pillars, Jachin and Boas (firmness and strength), without a constructive function, flanking the entrance, which was, as in ancient times, in the east. The sanctum was in the west. The interior consisted of an anteroom, the hallow with the golden candlesticks and the gold plated showbread-table and the incense-altar, as well of a square backroom of 20 cubits in length behind it, the most holy with the ark of the covenant and two big cherubim. The anteroom included steps 13 and 14. This was followed by the long cyclical path of the sacred up to step 17, and then the step 18 with the inauguration coffin. The Tarotcard 18 shows the two columns which have now grown to 2 fixed towers. Step 19 was not possible from the point of view of ancient Kabbalists because of a unity with the En-Soph or with Jehovah, similar to Islamic view with Allah. This esoteric Freemasonry, to which also alchemists like Basilius Valentinus belonged, also referred to this old testament story. The two columns have their counterpart in the currents of Ida and Pingala in yoga, which develop into two pillars. "God" - as Elohim or Elauhim or Eloihim - is here the force that leads the process to step 16 (similar to 'Moses'). At first, God separates light and darkness (which is reminiscent of hindu - MAYA -'in man') - at step 2. God creates the plants before the creation of the sun ! At the fifth day he creates the animals and man : 27 And God created man in His own image, in the image of God created He him; male and female created He them. On the sixth day, ELOHIM creates the Adam ('' man '') according to his own image - as man and woman. "(step 6) The word 'Adam' means red earth, and ădāmāh" means arable ground. The tarotcard 6 shows a similar polarity. 7Then God rested (like the ruler with chariot animals on Tarotcard 7). 3 And God blessed the seventh day, and hallowed it; because that in it He rested from all His work which God in creating had made. Then the LORD God formed man of the dust of the ground, and breathed into his nostrils the breath of life; and man became a living soul. Then He placed the man whom He had formed in a garden that he planted "eastward in Eden". After that he creates Eva ('the animated'- animated from Prana, step 8.2 - esoteric : Venusphase ) from Adam's rib of his right side. The temptation by the serpent follows at step 9, which corresponds to the slight awakening of the purified fiery Kundalini snake of yoga. The tarotcard 9 similarly shows the eremite with a (snake) rod and the snake. Then the so-called "expulsion" takes place. The Tarotcard 10 shows similarly the united forces and above the guard with the sword, the angel before the paradise. This is followed by the birth of Cain (step 11) and then foolows the birth of Abel (breath, whiff - step 12), who stand for the two known columns (as on tarotcard 12). At step 13 the spirit-man KAIN kills the higher nature-man ABEL(Gen 4,1–16 LUT): Atfer this Kain goes the path of the stranger on earth - with the sign on the forehead (step 14). He then has many offsprings (step 15, 2nd initiation). God places up two cherubimes who guard the way to the Tree of Life (step 10), the guardians of the Threshold, which the Seeker has to self-realize in order to enter Paradise. Genesis 3:24 : So He drove out the man; and He placed at the east of the garden of Eden the cherubim, and the flaming sword which turned every way, to keep the way to the tree of life. Also the 'Ark of the Covenan'(Tiberian ʾĀrôn Habbərîṯ) in the Mishkane was decorated with two cherubim statues, according to instruction of YHWH. Even Jakob Bohme wrote in his 'Mysterium Magnum' (Explanation of the First Book of Moses) about the secret significance of Genesis: "The formation of Eve is the greatest mystery, for one must fully understand the birth of nature and human origin If you want to see the reason. For she is the half Adam, not taken from Adam's flesh, but from his essence, from the female part. She's Adam's Matrix. " 'Although flesh and blood can not grasp the divine essence, but the spirit when it is enlightened and lit by God (Aurora, Dawn, 1:1). Another deeply veiled story is the way of Avram (אַבְרָם‎) and his wife Sarai (שָׂרַי‎) to Abraham. Avram ('father of many') is a son begotten by Terach ('wild goat, station'), a son of Nahor, at the age of 70 years. Terah goes from Ur in Chaldea to Haran and takes Avram, Lot and Sarai with him and dies there later. On the orders of Yahweh, Avram then went to Canaan at the age of 75 with Lot and Sarai. After separation of the nepheus Lot ('Kiesel', U.Path 6), the refined vital essence component, who draws into the Jordan Valley near Sodom and Gomorra (Lot also survives their later destruction by two angels), Avram still lives farther in the country Kanaan (אָרָםהָם). He first gets a son Ishmael ('Yahweh hears', ie, step 10, Genesis 16: 3) from Sara's slave Hagar ('Escape, Emigration'). First after this Abraham receives his son Isaak ('Laughter'), whom he tries to sacrifice in the land of Moria ('Yahweh is my teacher') on a mountain ('YHWH') on Yahwehs order. Ishmael is at the last moment saved by Yahweh and replaced by a ram - sacrifice (of the 'lower nature') (:1st big initiation). Yahweh had promised that he would bless Sara (i) and that she would bear Avram a son within a year. Furthermore, Yahweh promises that from her will emerge peoples and kings (2nd initiation). From Ishmael he would make a nation . The expulsion of Hagar's son Ishmael and the retreive by Yahweh correspond to the second and third pace of stage 15. The destruction of Sodom and Gomorrah by Yahweh refers to step 16 and further.